When the upper beak is overlapping the bottom you will have to trim the upper beak. You can tell where to cut it because the beak that has grown over the end is normally a slightly different color. You can also look inside the mouth and see where the fleshy part ends. Then you take human toenail clippers and trim the tip of the beak off (one never needs to clip anything but the tip of the upper beak). If it is cut too short, it will bleed a little bit, but, because I am always carefull, I’ve never seen a bird where this is serious. Sometimes I trim my birds’ beaks too short on purpose because I think it helps to deter egg eating. Mostly, one cuts the beak so that it just looks right. The upper beak will still overlap the bottom just a little bit. 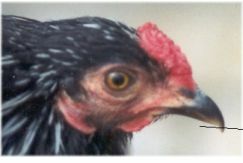 This image shows how short to trim the upper beak.